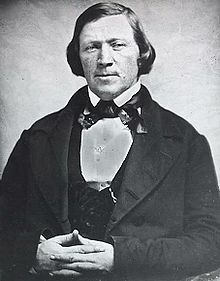 Brigham Young (June 1, 1801 – August 29, 1877) was the second prophet and president of The Church of Jesus Christ of Latter-day Saints. He was also the first governor of the Utah Territory. Now hear it, O inhabitants of the earth, Jew and Gentile, Saint and sinner! When our father Adam came into the garden of Eden, he came into it with a celestial body, and brought Eve, one of his wives, with him. He helped to make and organize this world. He is MICHAEL, the Archangel, the ANCIENT OF DAYS! about whom holy men have written and spoken-He is our FATHER and our GOD, and the only God with whom WE have to do. Every man upon the earth, professing Christians or non-professing, must hear it, and will know it sooner or later. They came here, organized the raw material, and arranged in their order the herbs of the field, the trees, the apple, the peach, the plum, the pear, and every other fruit that is desirable and good for man; the seed was brought from another sphere, and planted in this earth. The thistle, the thorn, the brier, and the obnoxious weed did not appear until after the earth was cursed. When Adam and Eve had eaten of the forbidden fruit, their bodies became mortal from its effects, and therefore their offspring were mortal...It is true that the earth was organized by three distinct characters, namely, Eloheim, Yahovah, and Michael, these three forming a quorum, as in all heavenly bodies, and in organizing element, perfectly represented in the Deity, as Father, Son, and Holy Ghost. This concept is commonly referred to as the "Adam–God theory." I say, rather than that apostates should flourish here, I will unsheath my bowie knife, and conquer or die. (Great commotion in the congregation, and a simultaneous burst of feeling, assenting to the declaration.) Now, you nasty apostates, clear out, or judgment will be put to the line, and righteousness to the plummet. (Voices, generally, "go it, go it. ")If you say it is right, raise your hands. (All hands up.) Let us call upon the Lord to assist us in this, and every good work. Will the Constitution be destroyed? No: it will be held inviolate by this people; and, as Joseph Smith said, "The time will come when the destiny of the nation will hang upon a single thread. At that critical juncture, this people will step forth and save it from the threatened destruction." It will be so. I can sum up all the arguments used against Joseph Smith and "Mormonism” in a very few words, the merits of which will be found in "OLD JOE SMITH. IMPOSTOR, MONEY DIGGER. OLD JOE SMITH. SPIRITUAL WIFE DOCTRINE. IMPOSTURE. THE DOCTRINE IS FALSE. MONEY DIGGER. FALSE PROPHET. DELUSION. SPIRITUAL WIFE DOCTRINE. Oh, my dear brethren and sisters, keep away from them, for the sake of your never dying souls. FALSE PROPHETS THAT SHOULD COME IN THE LAST DAYS. OLD JOE SMITH. ANTI-CHRIST. MONEY DIGGER, MONEY DIGGER, MONEY DIGGER. And the whole is wound up with an appeal, not to the good sense of the people, but to their unnatural feelings, in a canting, hypocritical tone, and there it ends. Young’s comments regarding criticism of Joseph Smith, Jr. and Mormonism. In my conversation, I shall talk and act as I please. Still I am always aware, when speaking in public, that there are those present who are disposed to find fault with this people, and to try to raise a prejudice against them; and they will pick up isolated words and sentences, and put them together to suit themselves, and send forth a garbled version to prejudice the world against us. Such a course I never care anything about; for I have frequently said, spoken words are but wind, and when they are spoken are gone; consequently I take liberties in speaking which I do not allow when I commit my sentiments to writing. Young predicts that people will take his written words and rearrange them to suit themselves. I will take the Government of the United States, and the laws of Missouri and Illinois, from the year 1833 to 1845, and if they had been carried out according to their letter and spirit, they would have strung up the murderers and mobocrats who illegally and unrighteously killed, plundered, harassed, and expelled us. I will tell you how much I love those characters. If they had any respect to their own welfare, they would come forth and say, whether Joseph Smith was a Prophet or not, "We shed his blood, and now let us atone for it;" and they would be willing to have their heads chopped off, that their blood might run upon the ground, and the smoke of it rise before the Lord as an incense for their sins. I love them that much. But if the Lord wishes them to live and foam out their sins before all men and women, it is all right, I care not where they go, or what they do. Young's response to those that persecuted the Mormons in Missouri and Illinois. The Lord did not come with the armies of heaven, in power and great glory, nor send His messengers panoplied with aught else than the truth of heaven, to communicate to the meek the lowly, the youth of humble origin, the sincere enquirer after the knowledge of God. But He did send His angel to this same obscure person, Joseph Smith Jun., who afterwards became a Prophet, Seer, and Revelator, and informed him that he should not join any of the religious sects of the day, for they were all wrong; that they were following the precepts of men instead of the Lord Jesus; that He had a work for him to perform, inasmuch as he should prove faithful before Him. Young comments on Joseph Smith’s visions. This quote is often presented in a heavily edited form which reads: "The Lord did not come…But he did send his angel to this same obscure person, Joseph Smith Jun.,…"
I would rather that this people should starve to death in the mountains, than to have the Lord Almighty hand us over to a cursed, infernal mob. I would rather go down to the grave in peace than to fight a mob, unless the Lord would give me enough Saints to fight and kill the poor devils; in such case I wish to live and fight them. But I never want to see a mob again drive and tread under foot the Saints. I will tell you what this people need, with regard to preaching; you need, figuratively, to have it rain pitchforks, tines downwards, from this pulpit, Sunday after Sunday. Instead of the smooth, beautiful, sweet, still, silk-velvet-lipped preaching, you should have sermons like peals of thunder, and perhaps we then can get the scales from our eyes. This style is necessary in order to save many of this people. There is not a man or woman, who violates the covenants made with their God, that will not be required to pay the debt. The blood of Christ will never wipe that out, your own blood must atone for it; and the judgments of the Almighty will come, sooner or later, and every man and woman will have to atone for breaking their covenants. To what degree? Will they have to go to hell? They are in hell enough now. I do not wish them in a greater hell, when their consciences condemn them all the time. Let compassion reign in our bosoms. Try to comprehend how weak we are, how we are organized, how the spirit and the flesh are continually at war. There are sins that men commit for which they cannot receive forgiveness in this world, or in that which is to come, and if they had their eyes open to see their true condition, they would be perfectly willing to have their blood spilt upon the ground, that the smoke thereof might ascend to heaven as an offering for their sins, and the smoking incense would atone for their sins, whereas, if such is not the case, they will stick to them and remain upon them in the spirit world … I do know that there are sins committed, of such a nature that if the people did understand the doctrine of salvation, they would tremble because of their situation. And furthermore, I know that there are transgressors, who, if they knew themselves, and the only condition upon which they can obtain forgiveness, would beg of their brethren to shed their blood, that the smoke thereof might ascend to God as an offering to appease the wrath that is kindled against them, and that the law might have its course. I will say further; I have had men come to me and offer their lives to atone for their sins. It is true that the blood of the Son of God was shed for sins through the fall and those committed by men, yet men can commit sins which it can never remit. As it was in ancient days, so it is in our day. Now take a person in this congregation who has knowledge with regard to being saved in the kingdom of our God and our Father and being exalted, one who knows and understands the principles of eternal life, and sees the beauty and excellency of the eternities before him compared with the vain and foolish things of the world, and suppose that he is taken in a gross fault, that he has committed a sin he knows will deprive him of the exaltation he desires, and that he cannot attain to it without the shedding of his blood, and also knows that by having his blood shed he will atone for that sin, and be saved and exalted with the Gods, is there a man or woman in this house but would say, 'shed my blood that I might be saved and exalted with the Gods?' All mankind love themselves, and let these principles be known by an individual and he would be glad to have his blood shed. That would be loving themselves, even unto an eternal exaltation. Will you love your brothers or sisters likewise, when they have committed a sin that cannot be atoned for without the shedding of their blood? Will you love that man or woman well enough to shed their blood?...I have known a great many men who have left this Church for whom there is no chance whatever for exaltation, but if their blood had been spilled, it would have been better for them. The wickedness and ignorance of the nations forbid this principle's being in full force, but the time will come when the law of God will be in full force. Never let a day so pass that you will have cause to say, "I will live better to-morrow,"
Which would you part with first-your tobacco, your whisky, or your religion? Your tea, or your religion? Which would you shake hands with and bid good-bye for ever-your coffee, or your religion? I should think I had disgraced the man that stands before you this day, if I loved any object on the earth better than I love my religion and my God. The Lord chose Joseph Smith, called upon him at fourteen years of age, gave him vision, and led him along, guided and directed him in his obscurity. "You see some classes of the human family that are black, uncouth, uncomely, disagreeable and low in their habits, wild, and seemingly deprived of nearly all the blessings of the intelligence that is generally bestowed upon mankind....Cain slew his brother. Cain might have been killed, and that would have put a termination to that line of human beings. This was not to be, and the Lord put a mark upon him, which is the flat nose and black skin." Journal of Discourses, vol. 2, 1863, p. 172. Journal of Discourses, vol. 10, 1863, p. 110. "For their abuse of [the Black African] race, the whites will be cursed, unless they repent." Young's comments about the Mountain Meadows massacre. Young discusses the Mormon prohibition against drinking coffee and tea, known as the Word of Wisdom. I very well recollect the reformation which took place in the country among the various denominations of Christians-the Baptists, Methodists, Presbyterians, and others-when Joseph was a boy. Joseph's mother, one of his brothers, and one, if not two, of his sisters were members of the Presbyterian Church, and on this account the Presbyterians hung to the family with great tenacity. And in the midst of these revivals among the religious bodies, the invitation, "Come and join our church," was often extended to Joseph, but more particularly from the Presbyterians. Joseph was naturally inclined to be religious, and being young, and surrounded with this excitement, no wonder that he became seriously impressed with the necessity of serving the Lord. But as the cry on every hand was, "Lo, here is Christ," and "Lo, there!" Said he, "Lord, teach me, that I may know for myself, who among these are right." And what was the answer? "They are all out of the way; they have gone astray, and there is none that doeth good, no not one. When he found out that none were right, he began to inquire of the Lord what was right, and he learned for himself. Was he aware of what was going to be done? By no means. He did not know what the Lord was going to do with him, although He had informed him that the Christian churches were all wrong, because they had not the Holy Priesthood, and had strayed from the holy commandments of the Lord, precisely as the children of Israel did. Young’s recollection of religious excitement and events leading up to Joseph Smith, Jr.’s first vision. Some, in their curiosity, will say, "But you Mormons have another Bible! Do you believe in the Old and New Testaments?" I answer we do believe in the Old and New Testaments, and we have also another book, called the Book of Mormon. What are the doctrines of the Book of Mormon? The same as those of the Bible…"What good does it do you, Latter-day Saints?" It proves that the Bible is true. What do the infidel world say about the Bible? They say that the Bible is nothing better than last year's almanack; it is nothing but a fable and priestcraft, and it is good for nothing. The Book of Mormon, however, declares that the Bible is true, and it proves it; and the two prove each other true. The Old and New Testaments are the stick of Judah. You recollect that the tribe of Judah tarried in Jerusalem and the Lord blessed Judah, and the result was the writings of the Old and New Testaments. But where is the stick of Joseph? Can you tell where it is? Yes. It was the children of Joseph who came across the waters to this continent, and this land was filled with people, and the Book of Mormon or the stick of Joseph contains their writings, and they are in the hands of Ephraim. Where are the Ephraimites? They are mixed through all the nations of the earth. God is calling upon them to gather out, and He is uniting them, and they are giving the Gospel to the whole world. Is there any harm or any false doctrine in that? A great many say there is. If there is, it is all in the Bible. It has been observed here this morning that we are called fanatics. Bless me! That is nothing. Who has not been called a fanatic who has discovered anything new in philosophy or science? We have all read of Galileo the astronomer who, contrary to the system of astronomy that had been received for ages before his day, taught that the sun, and not the earth, was the centre of our planetary system? For this the learned astronomer was called "fanatic," and subjected to persecution and imprisonment of the most rigorous character. So it has been with others who have discovered and explained new truths in science and philosophy which have been in opposition to long-established theories; and the opposition they have encountered has endured until the truth of their discoveries has been demonstrated by time. The term "fanatic" is not applied to professors of religion only...I will tell you who the real fanatics are: they are they who adopt false principles and ideas as facts, and try to establish a superstructure upon a false foundation. They are the fanatics; and however ardent and zealous they may be, they may reason or argue on false premises till doomsday, and the result will be false. If our religion is of this character we want to know it; we would like to find a philosopher who can prove it to us. We are called ignorant; so we are: but what of it? Are not all ignorant? I rather think so. Who can tell us of the inhabitants of this little planet that shines of an evening, called the moon? When we view its face we may see what is termed "the man in the moon," and what some philosophers declare are the shadows of mountains. But these sayings are very vague, and amount to nothing; and when you inquire about the inhabitants of that sphere you find that the most learned are as ignorant in regard to them as the most ignorant of their fellows. So it is with regard to the inhabitants of the sun. Do you think it is inhabited? I rather think it is. Do you think there is any life there? No question of it; it was not made in vain. It was made to give light to those who dwell upon it, and to other planets; and so will this earth when it is celestialized. Every planet in its first rude, organic state receives not the glory of God upon it, but is opaque; but when celestialized, every planet that God brings into existence is a body of light, but not till then. Christ is the light of this planet. God gives light to our eyes. I suppose that, if we were in the congregations of some of our Christian fellow-countrymen, we would not hear any children crying. I believe they have none in some societies. I am very happy to hear the children crying when it is really necessary and they cannot be kept from it. One thing is certain, wherever we go there is a proof that the people are keeping the commandments of the Lord, especially the first one—to multiply and replenish the earth. You will probably have what is called a Christian Church here; they will not admit that we are Christians, but they cannot think us further from the plan of salvation as revealed from heaven than we know them to be, so we are even on that ground, as far as it goes. You read in the revelations given to John on the Isle of Patmos, concerning the latter days, that a voice was heard crying to the Saints in Babylon-"Come out of her, O my people, be not partakers of her sins, lest ye receive of her plagues, for her sins have reached unto heaven," etc. Has this voice been heard? Yes, the Latter-day Saints have heard it. Has the angel flown through the midst of heaven and delivered the Gospel to the children of men? Yes, we believe all this. Do we believe that the Lord sent his messengers to Joseph Smith, and commanded him to refrain from joining any Christian church, and to refrain from the wickedness he saw in the churches, and finally delivered to him a message informing him that the Lord was about to establish his kingdom on the earth, and led him on step by step until he gave him the revelation concerning the plates? Yes, this is all correct. Did Joseph receive these revelations? He did. Did the heavenly messengers come to Joseph, and commit to him the keys of the Aaronic Priesthood? Yes, we believe all this. Did they commit to him the keys of the Melchizedek Priesthood? Yes. This is all correct, we believe all this. I say, if you want to enjoy exquisitely, become a Latter-day Saint, and then live the doctrine of Jesus Christ. This page was last edited on 5 November 2018, at 15:33.